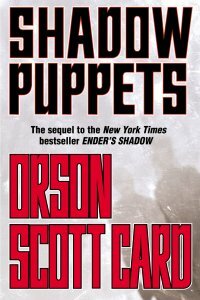 Description: Shadow Puppets was originally titled “Shadow of Death.” It is preceded by Shadow of the Hegemon and followed by Shadow of the Giant. “Earth and its society have been changed irrevocably in the aftermath of Ender Wiggin’s victory over the Formics. The unity forced upon the warring nations by an alien enemy has shattered. Nations are rising again, seeking territory and influence, and most of all, seeking to control the skills and loyalty of the children from the Battle School. But one person has a better idea. Peter Wiggin, Ender’s older, more ruthless brother, sees that any hope for the future of Earth lies in restoring a sense of unity and purpose. And he has an irresistible call on the loyalty of Earth’s young warriors. With Bean at his side, the two will reshape our future.